Located just west of downtown, it’s an odd little bakery. The building it’s in, butted up against the east side of Smith College, looks like a 1950s-era ranch home that someone long ago hastily converted to a bakery at some point (I suspect, but can’t confirm, that that’s what actually happened). 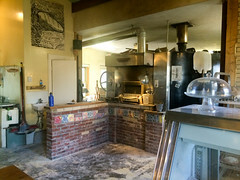 But since the early 2000s, Hungry Ghost has been home to a modest bakery using a large Llopis wood-burning oven to churn out a daily assortment of artisan breads, and in a more recent turn of events, pizzas. And it hasn’t gone unnoticed. Many days, particularly on weekends, Hungry Ghost sells out of bread early (and indeed, on the somewhat sleepy day we went, by 6pm they were out of almost all their bread), but then in the afternoons they shift to pizza. It’s still a bandwidth-limited operation done as first-come, first-served. We walked in, looked at the list of pizzas (16 different variants), and place orders for two pizzas and told to come back in a half hour after browsing through some of the nearby shops. But 25 minutes later, we returned, and our pizzas were just getting boxed up for us. We took them outside (the place is takeout only), claiming the only real “seating” the place has: a worn picnic table on the front lawn. And that’s when we finally got to behold our two pizzas: a classic Margherita (a great pizza for testing the mettle of a pizza place) and sausage and kale (was supposed to be sausage and rappini, but they ran out of rappini). First, both pizzas really showcased the oven. Good pizza really isn’t about the toppings, but the underlying flatbread. 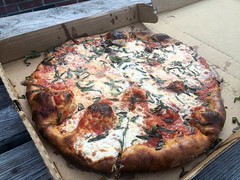 And here you can see that the folks of Hungry Ghost know there way around baking and wood-fired ovens, since this was a seriously good crust: thin, chewy, with a good crown around the edge matched up with a seriously good toasting on the bottom, approaching a char. 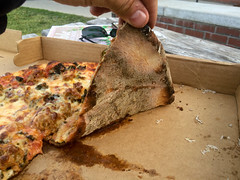 I’d happily eat some of this crust bare. Add in the toppings, and both pizzas were excellent: the Margherita being a perfect example of simplicity: a fairly rich tomato sauce applied somewhat sparingly, a rich layer of fresh, local mozzarella, a light brushing of oil, and some nice basil applied just as the pizza was coming out of the oven so it’s more “wilted” than “baked”. The result was splendid: a light set of delicious toppings that complemented, and didn’t hide, the wonderful crust underneath. 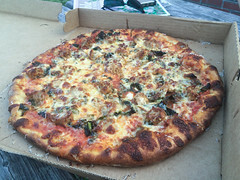 Similarly, the sausage and kale pizza was quite satisfying as well: a rather nice crumbled sausage (source unknown, the menu just said “Vermont sausage”, but this was a rather nice sausage blend), aged mozzarella, kale, and a slightly more ample coating of rich tomato sauce made for another thoroughly enjoyable pizza. Everything was hitting it off: good, crispy sausage, smooth melting cheese, kale just a little toothsome, and a nice sauce. Overall, we were very pleased with Hungry Ghost, enough so that I’ll happily show up early next time to see if they still have more breads available.